In a corridor surrounded by pipes, tanks and equipment, three women crouch over a tub. One – an intern veterinarian – carefully handles a Q-tip swab. The second – a veterinarian – readies a microscope slide. The third – an aquarist – has her gloved hands submerged, gently holding a china rockfish. A fourth aquarist shines a light on the whole procedure from above. 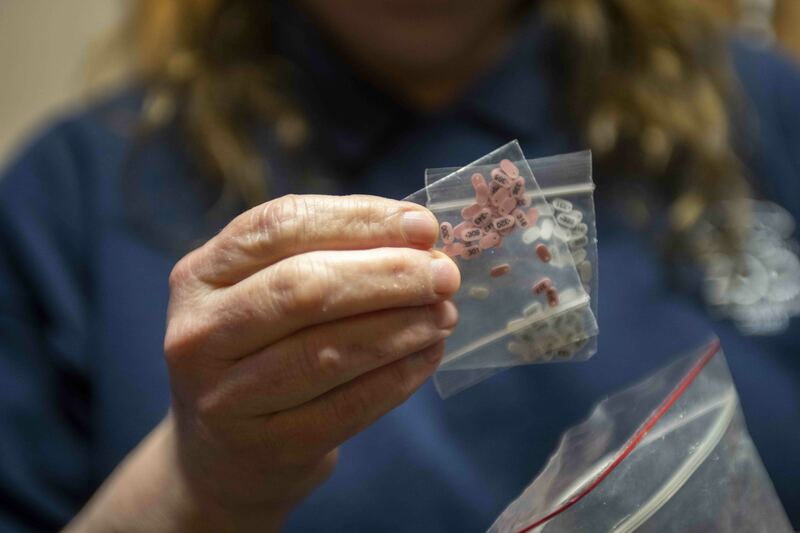 It’s all part of caring for Point Defiance Zoo & Aquarium’s smallest creatures – and part of the teamwork that makes that care possible. Dr. Kat Reed (left) and Dr. Kadie Anderson examine samples from a rockfish behind the scenes at the Pacific Seas Aquarium. “Here we go,” says intern vet Dr. Kat Reed, who’s leading today’s procedure of taking various samples from the rockfish to discover more about a lesion on its skin. The team is backstage in the working part of the Pacific Seas Aquarium, where the rockfish usually lives in the Northwest Waters habitat. Expertly, she swipes the long Q-tip across the fish’s big lips, held just above the surface by aquarist Mikiko Williams. (The gills remain under the surface, so the fish can breathe.) Reed seals the swab in a tube, next to a slide already containing a swab of skin. Then she picks up a tiny pair of scissors and crouches down again to get a microscopic sliver of the fish’s gill. Veterinarians take a swab of the rockfish’s lips to test for possible infection. Anesthetized via medication in the tub’s water, the fish rests calmly in Williams’ hands. With practiced precision, Reed lays the gill sample onto the slide held by veterinarian Dr. Kadie Anderson, who carefully seals and stores it. Finally, Reed asks Williams to turn the fish onto its back so she can draw a blood sample near the base of its tail. It’s a tiny amount – just 0.2 ml – but later in the lab it will be enough to discern whether the rockfish has an increased white blood cell count, indicating infection. “It’s just like when you or I get a complete blood count at the doctor’s,” explains Anderson. 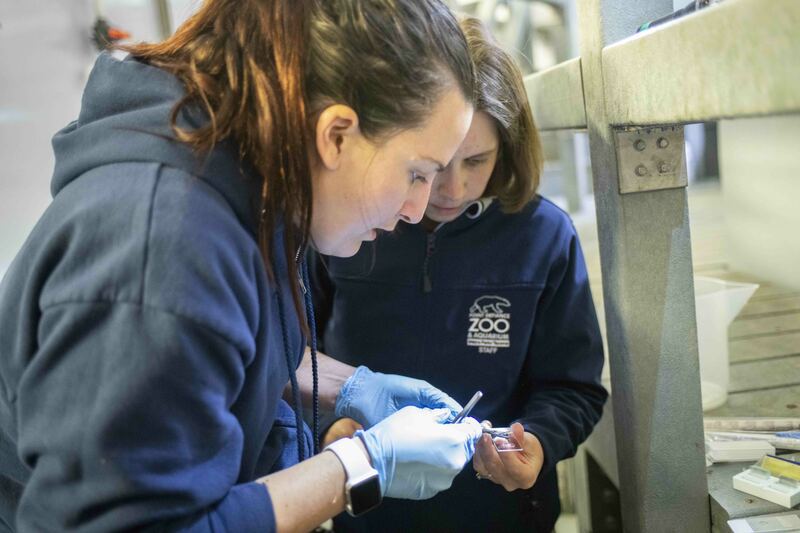 Meanwhile, Reed – a fully-qualified veterinarian who is completing her internship at Point Defiance Zoo – is poring over the small dark fish, examining its blue-and-yellow-speckled skin. 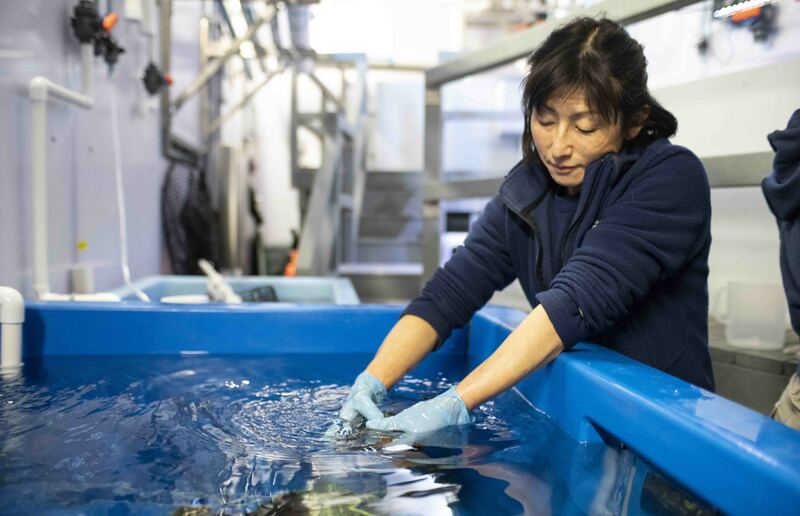 Aquarist Mikiko Williams swishes the rockfish in fresh seawater to awaken it after anesthetic. With one smooth movement Williams lifts the fish out of the anesthetic tub and into the big recovery tank. Still holding it in both hands, she begins “swimming” the fish back and forward to swish fresh seawater over its gills and wake it up. In a couple of minutes the tail moves. After a few minutes Williams releases the fish, who does a slow flip, then circles the water with fins outstretched for balance. Williams leans over to keep watch. “It’s like when you get off a ride at the fair,” smiles Reed sympathetically. Anderson packs up a neat case of equipment. 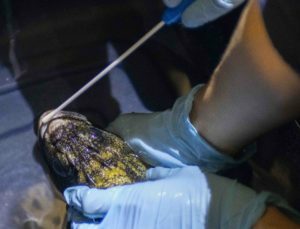 “We’ll let you guys know what we find when we’ve looked at the samples,” she tells Williams, and the two vets head out of the Pacific Seas Aquarium and across the Zoo. They’re bound for the old North Pacific Aquarium, now closed to the public but still home to just a few fish who live behind the scenes. Among them is a potbelly seahorse who hasn’t been eating well and needs some extra care – plus a “necklace” ID tag to help aquarists and vets easily keep watch on its health. 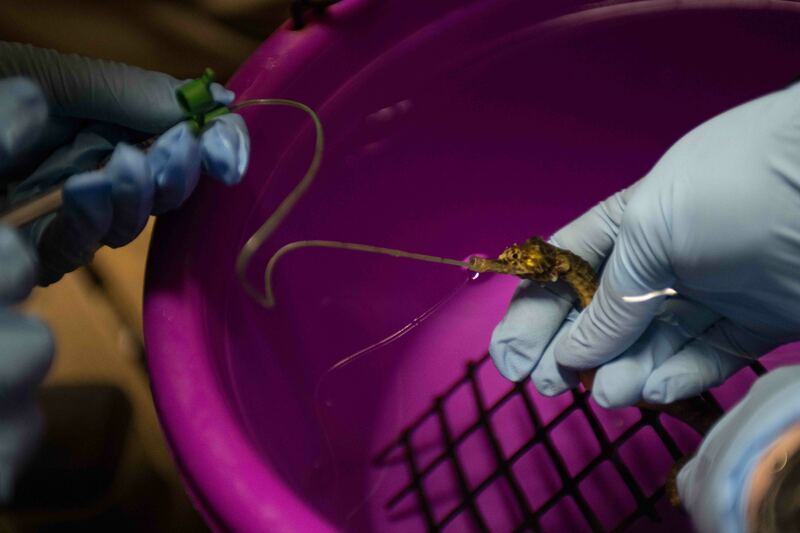 Vets feed a seahorse liquidized krill through a tube to help it eat. Behind the public doors the two vets make their way to where aquarist Cindy Kagey is waiting near the seahorse’s home exhibit. As she scoops it gently up into a small pink tub for the procedure and cradles her hands around its belly, it’s clear how much she cares about this tiny animal. First comes the food. Kagey has already whipped up a yummy krill shake, green with added spirulina, to give the seahorse a superdose of nutrients. Anderson draws the shake up into a small syringe, then attaches a tube so thin it looks more like string. 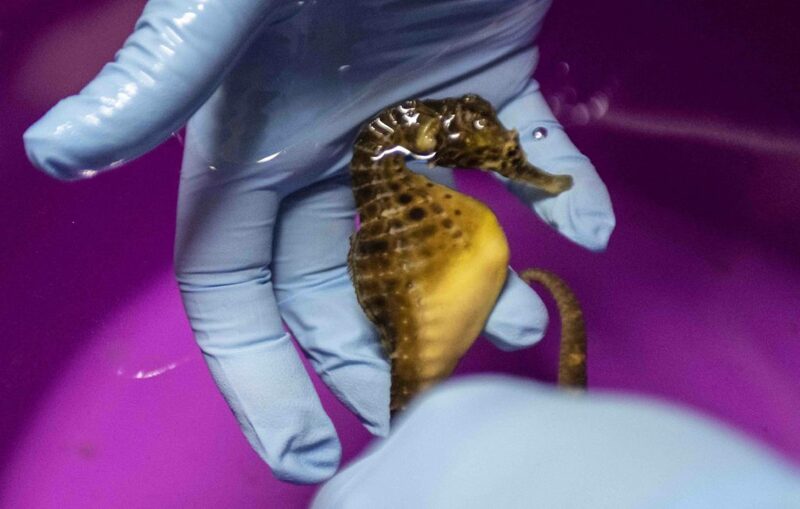 Slowly, tenderly, she inserts the tube into the seahorse’s long “snout” – a movement as tricky as threading a needle. As Anderson sends the green shake down the tube, the little seahorse curls a tail around Kagey’s pinkie finger (usually non-swimming animals, seahorses like to “hitch” onto stable objects to catch their food) and starts to gulp, eyes wide. “Ohhh,” sigh all three women, in unison. Neck ID tags used on fish help the animal care team monitor health. Meanwhile, Reed has taken out a tiny pink tag about a quarter the size of a pinkie fingernail. It has the number “300” etched onto it. Reed slides the tag onto a length of regular suture thread, which won’t harm the seahorse and will take a long time to dissolve in water. With Kagey still cradling the seahorse, she ties it on in a loop around the animal’s slender neck, Anderson helping hold the knot in place with tweezers. 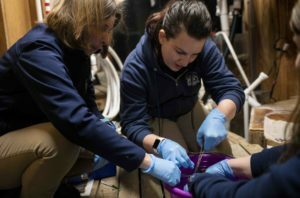 Veterinarians Dr. Kadie Anderson (left) and Dr. Kat Reed, assisted by aquarist Cindy Kagey (right), tie an ID tag with suture thread around a seahorse’s neck to help monitor its health. And then it’s over, the little seahorse a lot perkier after his meal and sporting a new pink necklace on his brown skin. Kagey carries him over and lowers him gently back home. Anderson and Reed walk around to the front of the exhibit to watch him settle back in. They’re not sure why he’s not eating properly, but they suspect a parasite. “We’ll continue to treat his water for that, to clear everything out of his environment,” Anderson says. He’s a tiny animal who lives out of public view. But he’s as important as any other animal in the Zoo, and gets the same expert, passionate care from the humans that look after him. We’re expecting a baby tapir!